Years of exhaustive (and exhausting) field work out of Portland State University has produced some stunning visual images online. Not quite two years ago, reporter Sasha Khokha and I joined geologist Hassan Basagic on a long trek to photograph the Dana Glacier, located just inside the eastern edge of Yosemite National Park. 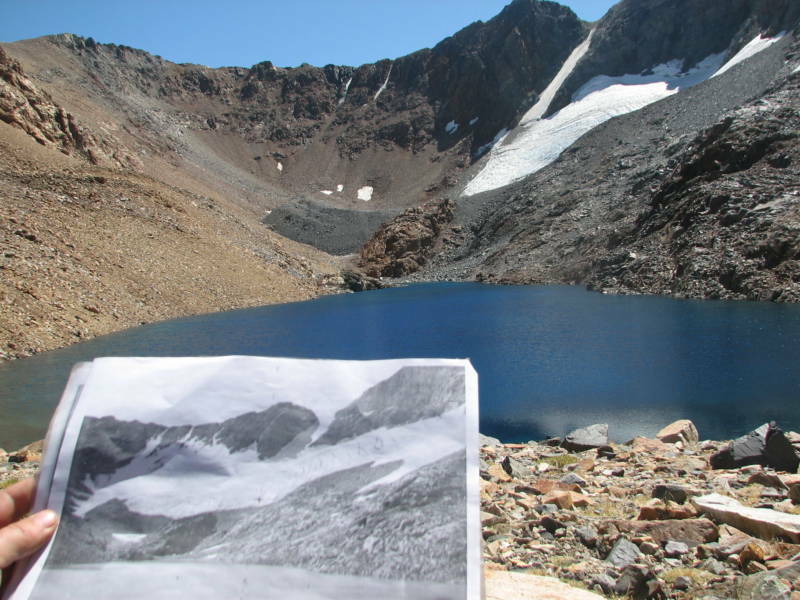 Since 2003, Basagic has been documenting the changes in the glaciers of the Sierra using historic photographs, and we joined him in September of 2008 to see the shrinking glacier for ourselves. We documented the trip with a radio report, an audio slide show, and web videos. That field work was part of a project called “Glacier Rephotography of the American West” which tracks the retreat of glaciers across the western United States over the last century. Tom Knudson of the Sacramento Bee, who has closely followed the project, tells us that it has produced a new online resource. It includes a series of interactive time lines that showcase historic photos as well as more recent ones (including Basagic’s) that, when viewed side by side, offer some startling views of how glaciers in various regions have changed. For more remarkable images of moving glaciers, explore the “Extreme Ice” episode of the PBS series Nova. Did you check for ancient vegetation uncovered by the retreating glacier?